Set on the edge of the ocean between the Batu Karu Mountain and terraced rice fields, Soori Bali is a hidden refuge, rejuvenating and peaceful; it is Bali as it should be. Designed, owned and operated by renowned architect Soo K. Chan and his wife Ling Fu, the resort priorities environmental and cultural sustainability. Crafted out of local materials, Soori Bali maintains a true sense of place. Keeping things pure, its restaurants use fresh produce from nearby farms and spices from its own garden; the resort’s spa uses only the highest quality organic products. All Soori Bali’s villas feature private pools with sweeping vistas. 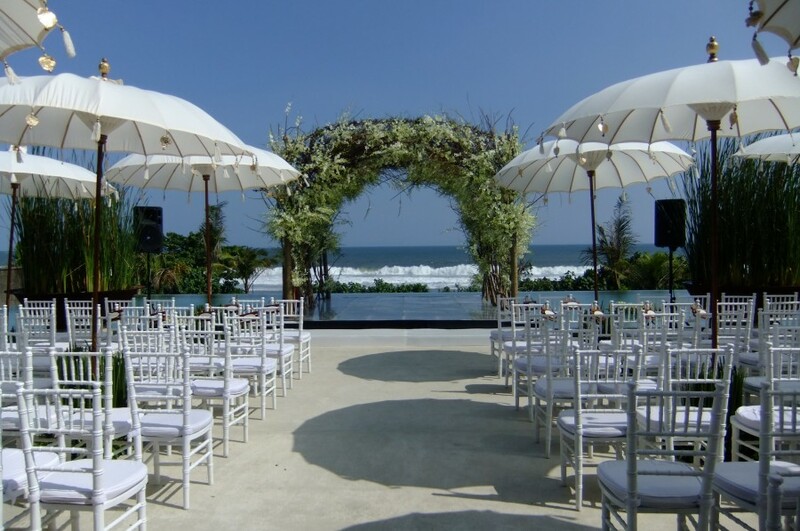 Within easy reach of the legendary Tanah Lot and an 18-hole championship golf course, the resort is perfect for those seeking spiritual and recreational delights. There are few places that revere nature’s gifts like we do, and absolute discretion for our guests is the pattern of our craft. Soori Bali is an amazing place to be, naturally. Wedding ceremony decoration with one wedding arch and altar table, one altar flower arrangement, white flower petals, flower shower, white ribbons, wedding signboard with bride and groom’s name.